As a part of the non-specific humoral immune system, the complement system has an important significance for the immune defense, particularly against bacterial infections. The complement system is activated on three different ways of proteolytic cascades, the classical, the alternative and the lectin (MBL) pathway. Through the central activation of C3 all of them are leading to the activation of the annular membrane attack complex, which forms pores in the target cells (eg bacteria, antibody-loaded cells, enveloped viruses) and lyses them. Other effects are the labeling of target cells as a target for phagocytosis and the chemotactic recruitment of inflammatory cells. 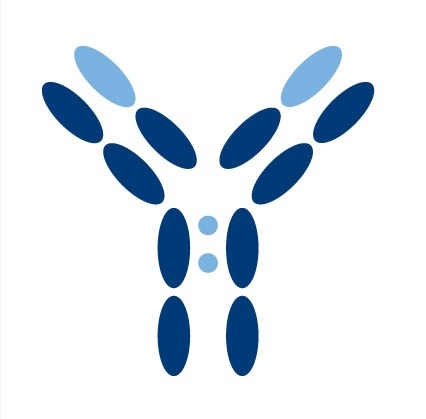 Genetic immunodeficiencies are known for various components of the complement system, resulting in eg hereditary angioedema (HAE), in specific frequent and / or severe bacterial infections, autoimmune disease-like disorders or other symptoms. The complement system consists of a large number of different plasma proteins which react with one another in order to opsonize pathogens and induce a series of inflammatory responses to infectious agents. 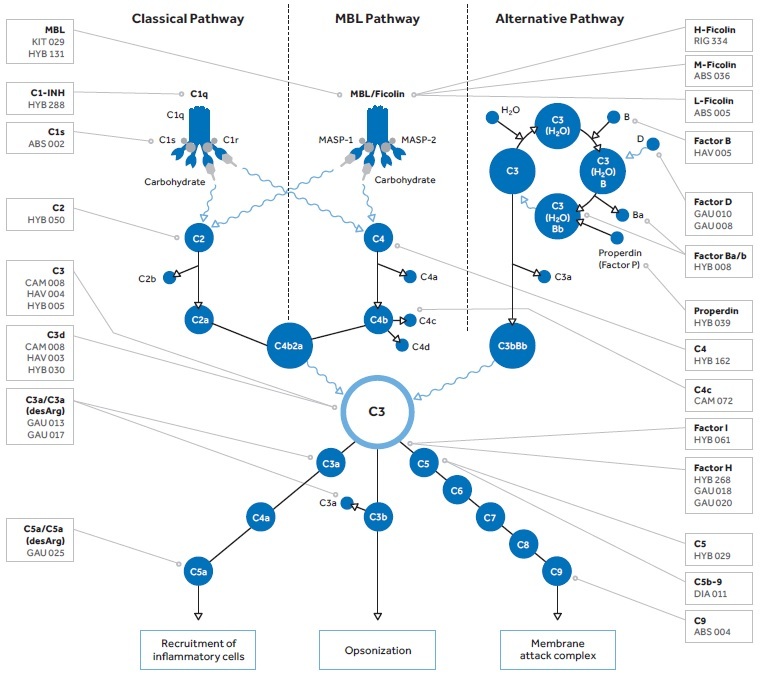 The investigation of the complement system is of great importance since Complement Deficiencies are associated to many diseases, such as autoimmune diseases and recurrent bacterial infections. For example, deficiency in C3, which plays a central role in the activation of the Complement System, may lead to life-threatening pyogenic infections, among other diseases. A hereditary deficiency of Mannose-binding Lectin (MBL) is by far the most common immunodeficiency worldwide. At least 12% of Europeans have a strong lack of MBL due to various mutations of the MBL gene (Steffensen et al 2000 J Immunol Methods 241 (1-2). : 33-42). A clinically relevant MBL Deficiency is found if MBL serum levels are below 50-100 ng/ml. Reduced MBL serum levels of < 450 ng/ml are associated with increased susceptibility to infections. Persons with reduced MBL values become clinically apparent especially in combination with a second immune defect or under other underlying diseases such as infections or cancer therapy. For fertility treatment the measurement of MBL is useful in women with a chronic tendency to bacterial infections, with increased susceptibility to Candida infections, or with a history of repeated hospitalization, in order to justify and optimize prophylactic and therapeutic measures for the prevention of infection risks (vaginal infection during hormonal treatment, amnion infection). In case of pulmonary inflammation, it is useful to immediately identify patients with suspected MBL deficiency, as this indicates an early antibiotic therapy. In delayed administration of antibiotics, MBL-deficient patients tend to persist after infected pulmonary infections. 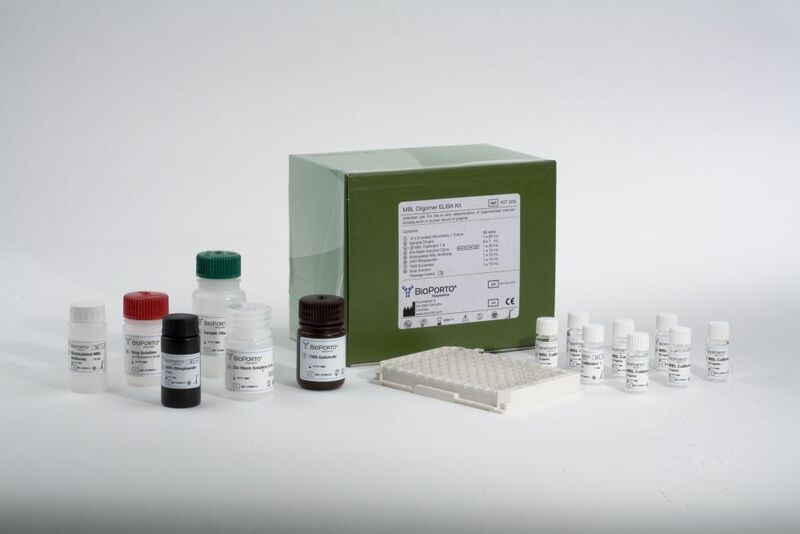 The MBL Oligomer ELISA (KIT 029) from BioPorto Diagnostics is the most published and validated MBL test for screening of patients with a suspected immunodeficiency in clinical routine and research. Its high specificity for oligomerized MBL molecules (the functional MBL structure) makes it a gold standard for consistent results and reliable diagnosis of MBL deficiency. It enables the quantitative measurement of MBL in serum and thus an approximate differentiation of the genetic defect variant.